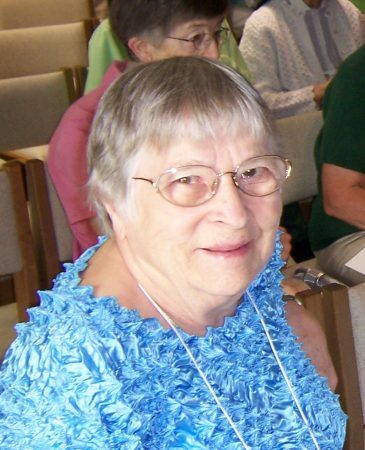 Catherine Julia, born in 1926, was the sixth of thirteen children born to William and Catherine Badour Groulx in Munger, Michigan. She was the first of her family to attend high school, graduating at the top of her class. After attending Bay City Junior College she taught in a one-room school at Arn Station in Bay County. She entered the Grand Rapids Dominicans in 1950 and in 1950, at Reception, she received the name Sister Julia Mae of the Holy Ghost. While teaching in several Michigan cities she earned an MA in Education and an MA in Religious Education. She also served as school principal while teaching for three years in Belen, New Mexico. While spending a year in Japan in 1989 she taught English Conversation at the Heisei Foreign Language Institute, living in a small apartment in Onga-Gun and enjoyingthe local culture. From 1990 to 1996, Sister Julia Mae was a live-in companion to two older women. This prepared her for a ministry at Saints Peter and Paul Parish in Ionia, where she worked as Bereavement Ministry Coordinator. Sister Julia Mae retired to Marywood in 2008 and serves as campus photography assistant. Sister Julia Mae Groulx celebrates her 60th Jubilee with friends and family. Sister Julia Mae Groulx crochets lovely table toppers for the gift shop.